As we march onwards to July, TheatreWorks is thrilled to present a brand new work – The Roundest Circle by Eng Kai Er, Faye Lim and Felicia Lim! In her latest work, Kai, Faye and Felicia challenge themselves by breaking all structure and taking out a key figure – the ‘leader’ from their decision making process. With no designated leader, they perform simultaneous leading and following, sharing and giving up physical and creative space. What will be the outcome? Is the absence of a leader possible in making a performance? Join us in this journey of discovery with Kai, Faye and Felicia as they venture into the undiscovered and the unchartered. To book your tickets, email theroundestcircle@theatreworks.org.sg or call us at 6737-7213. Find out more about The Roundest Circle at our engagement blog here! The Roundest Circle marks Kai’s third full production with TheatreWorks, after INDULGENCE (2015) and She Ain’t Heavy, She’s Reaching Into Space (2016), as part of her Associate-ship. TheatreWorks believes it is crucial to extend support to independent artists and does so through its Associate Artist Programme – a long-term platform to nurture and build the creative capacity of performance makers. It is a platform to enable artists to create boundary-pushing works. Past associates include Choy Ka Fai, Joavien Ng, Vertical Submarine and Charles Lim. TheatreWorks Associate Artists have access to resources and opportunities for artistic research and for developing their works. We intend to constantly build on our circle of Associates, and in developing them, we grow and develop the Singapore arts ecosystem. This entry was posted in 72-13, TheatreWorks, Uncategorized and tagged art, artist, arts, associate, Associate Artist, associateship, dance, dance artist, dancers, eng kai er, Faye Lim, Felicia Lim, performance, readings, singapore, theatre on June 28, 2017 by TheatreWorksSg. ArtsPicks this week – The Roundest Circle! Looking for something to do tonight – Friday, 21 April? Or tomorrow Saturday 22 April? 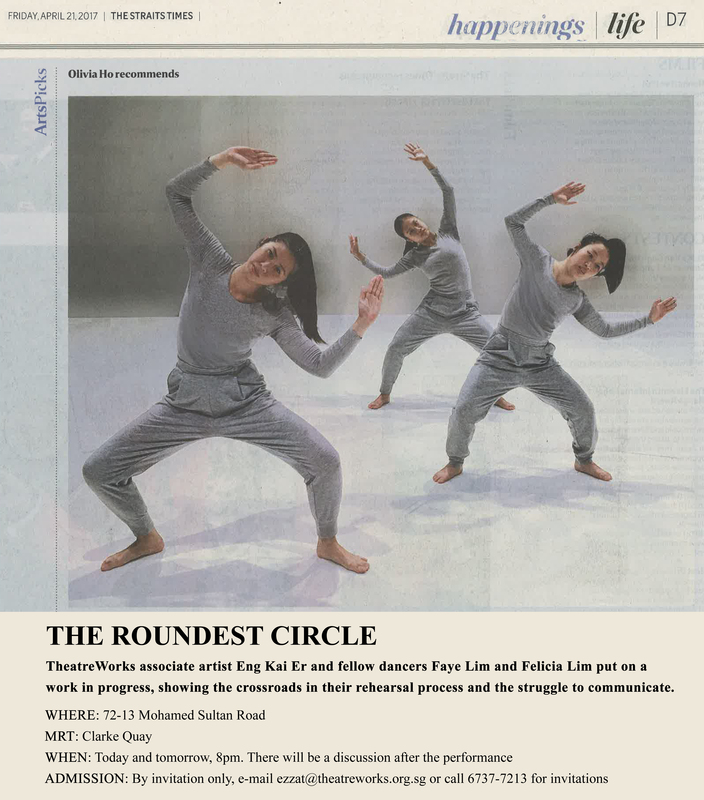 Come on down to TheatreWorks home, 72-13 and catch our brand new work – The Roundest Circle! Presented by dance artists Eng Kai Er, Faye Lim and Felicia Lim. Come witness as they translate their shared knowledge into a unified performance. The work is rooted in their practice of dance improvisation and driven by curiosity, collaboration, and contestation of ideas. Kai Er, Faye and Felicia are at the halfway point of their project due for presentation in July. In this April work-in-progress showing, see what they have been exploring from January to April! And in the post-performance dialogue, tell them what you think! Email ezzat@theatreworks.org.sg to reserve your seats now! The Roundest Circle is part of TheatreWorks’ Associate Artist Programme and TheatreWorks’ long established belief in developing and nurturing Singapore artists. It is also part of TheatreWorks’ aim to present innovative contemporary experiences and artistic expression that offer Singapore audiences alternatives. Its home, 72-13 is an incubator for artistic experiments by both artists and creative, while being a consistent conduit for dialogues between disciplines and cultures. This entry was posted in 72-13, TheatreWorks, Uncategorized and tagged 72-13, artist, arts, ArtsPicks, associate, associateship, dance, dance artist, dancers, performance, Straits Times, theatreworks, TheatreWorksSg, thingstodo on April 21, 2017 by TheatreWorksSg. Come speak with Associate Artist Eng Kai Er tomorrow! As you probably would have seen from our Facebook Page, we will be starting off our 2017 season with an engaging artist talk by Eng Kai Er – our very own Associate Artist! ‘A Conversation with Eng Kai Er’ will be happening tomorrow, 5 April 2017, 8pm at 72-13, Mohamed Sultan Road. Admission is free, but for a hassle-free registration do reserve your seats by emailing ezzat@theatreworks.org.sg or you could also just walk in tomorrow too! More on the talk – Kai will be sharing on her latest venture in running a performing arts studio – Make It Share It (MISI). Other than discussing MISI’s programmes from a personal perspective, Kai will also be expressing her love and thinking of body-based communication, performance, and labour; as well as her thoughts of exclusion/inclusion in the performing arts, and the conditions of the current arts ecosystem. Here’s a little sneak peak on what Kai will be presenting tomorrow! Don’t miss out on this session as Eng Kai Er highlights the parallels and contradictions between performance-making and running a studio. Come broaden and share your perspectives with us on Kai’s talk tomorrow! This talk is organised as part of Eng Kai Er’s Associateship with TheatreWorks – a platform to nurture and build the creative capacity of performance makers. This entry was posted in 72-13, Engagement, TheatreWorks, Uncategorized and tagged 72-13, art, artist, arts, associate, Associate Artist, associateship, community, eng kai er, engagement, performance, performing arts, singapore, speech, talk, theatreworks, TheatreWorksSg on April 4, 2017 by TheatreWorksSg. In April, TheatreWorks Associate Artist, Eng Kai Er kicks off our main season with two programmes as part of her Associateship! First up — A Conversation with Eng Kai Er On 5 April. Kai will share about her latest venture, running a performing arts studio — Make It Share It (MISI). In this session, Kai will discuss MISI’s programmes from a personal perspective; expressing her love and thinking of body-based communication, performance, and labour; and also her thoughts of inclusion/exclusion in the performing arts and the conditions of the current arts ecosystem. Join us for this engaging talk as Kai highlights the parallels and contradictions between performance-making and running a studio. Then join us once again on 21 & 22 April for The Roundest Circle. Developed in collaboration by Eng Kari Er with dance artists Faye Lim and Felicia Lim. See what they have been exploring since January to April and share with them what you think during the post-show dialogue! Want to be the first to know about TheatreWorks upcoming programmes? Join our mailing list today! This entry was posted in 72-13, Engagement, TheatreWorks, Uncategorized and tagged 72-13, art, artist, arts, associate, associateship, dance, dance artist, eng kai er, engagement, interview, Kai, Kai Er, performing arts, talk on March 24, 2017 by TheatreWorksSg. What’s happening this week at 72-13? Entering into the sixth week (and the last week!) of the Singapore International Festival of Arts (SIFA), here is THE event wrapping up the series of this year’s edition performances held at 72-13! Making And Doing is a landmark collaboration with Bill T. Jones, one of the world’s foremost multi-talented artists with an illustrious and award-winning career as a dancer, choreographer, theatre director, and writer. A new lecture-performance freshly made in 2016, expect an explosive fusion of music, dance, and his company of virtuosic dancers. Through rapid movement and gesture, Jones speaks about creativity: how to take an idea from inception to stage and what it means to be a maker in the world today. Join Bill T. Jones in this rare, one-night-only opportunity to gain some insight into the mind of a creative genius from the contemporary dance world. For more information and updates on future TheatreWorks’ events, do stay tuned on this very blog and check out our social media pages – Facebook, Instagram, Twitter –! This entry was posted in 72-13, Uncategorized and tagged 72-13, artist, dance, performance, sifa, sifasg, singapore on September 13, 2016 by TheatreWorksSg. We are now in the second-last week of the Singapore International Festival of Arts! There may not be much buzzing this week at 72-13, but we sure have one programme to keep you excited! This entry was posted in 72-13, Uncategorized and tagged 72-13, artist, sifa, sifasg, singapore on September 5, 2016 by TheatreWorksSg.